A little paint goes a long way in redoing a once gloomy rental. 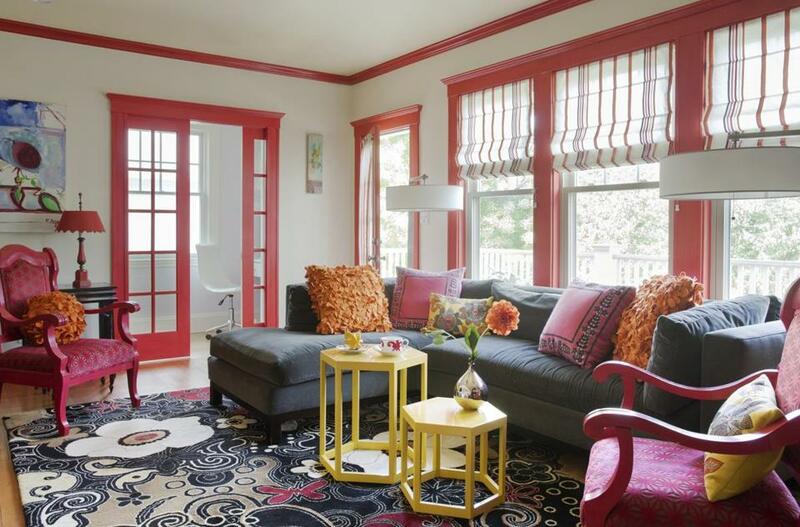 A swirly rug from Crate & Barrel grounds the living room while hexagonal tables from West Elm add a pop of sunshine. The client, whose husband had purchased the place as a rental property back in 2001, decided to give Pribell free rein, with one directive: The home should be light and bright, with plenty of color. It was essential that the space be welcoming, so she could entertain and build a community. And the client knew that, given our frigid winters, she would be spending a lot of time indoors with the couple’s three young children. The white cabinetry that the clients had chosen for their new kitchen was Pribell’s starting point; against it, the right colors would pop like crazy. The palette she devised grew out of a recent trip to Mexico, where she was inspired by rambling bougainvillea. “The blooms had a myriad of colors — yellow, orange, red, and magenta.” To her, the colors expressed sunshine and heat, so she brought them north for warmth. 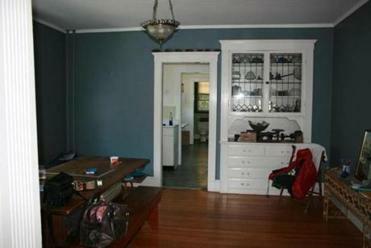 BEFORE: The home’s palette was much darker before the redesign. The first thing Pribell tackled were the risers on the stairs between the first and second floors, painting them a hot cardinal red. She carried the color to the kitchen, punctuating the white cabinets with red-lacquered knobs and handles. For the walls, she chose less saturated but still lively shades of butterscotch and salmon, a surprisingly harmonious combination. The home’s furnishings echo those hues. 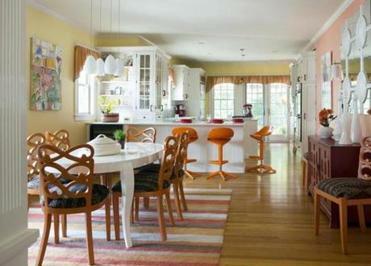 Bold orange stools by Kartell line the counter (“a huge extravagance given the budget, but worth it,” Pribell says), while carved Indonesian dining chairs and hand-blocked window treatments are done in an earthier shade of orange. The dining room flows into the living room, past a set of original columns. At first glance, the living room walls seem tinged with a rosy tone, but actually they’re white, as is the ceiling. “After all that color, it was important to allow for some relief,” says Pribell. Here, it’s the trim that’s painted red, the same shade used on the stair risers, but covered in a glaze to tone it down. The effect is sumptuous and multilayered, and the reflection from the trim gives the walls a pinkish cast. While nearly every stick of furniture is new, the wife requested that Pribell incorporate a pair of chairs that originally belonged to her great-grandmother. The polished wood, mustard upholstery, and old-fashioned silhouette hardly meshed with the project. That is, until Pribell treated the wood to several coats of that same magic red paint and glaze and had the chairs reupholstered in a red fabric with purple undertones from Romo. Overall, the couple were amazed at the results Pribell achieved by pushing the aesthetic beyond their comfort zone, turning what was once a nondescript house into a vibrant and happy home.